While browsing fabrics at the weekend, these jewel coloured cottons caught my eye. 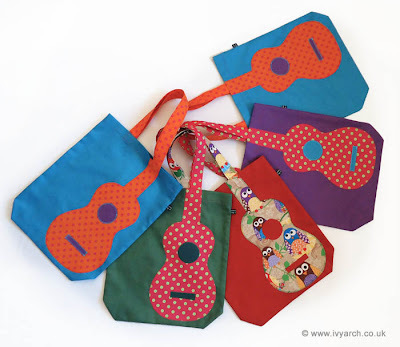 With appliqué ukuleles embroidered on top in bold polka-dot and owl print fabrics, these handmade book bags are cheery enough to brighten any grey day. I'll be making more appliqué bags in the next few weeks, but to snap one of these up now, visit my Etsy shop.